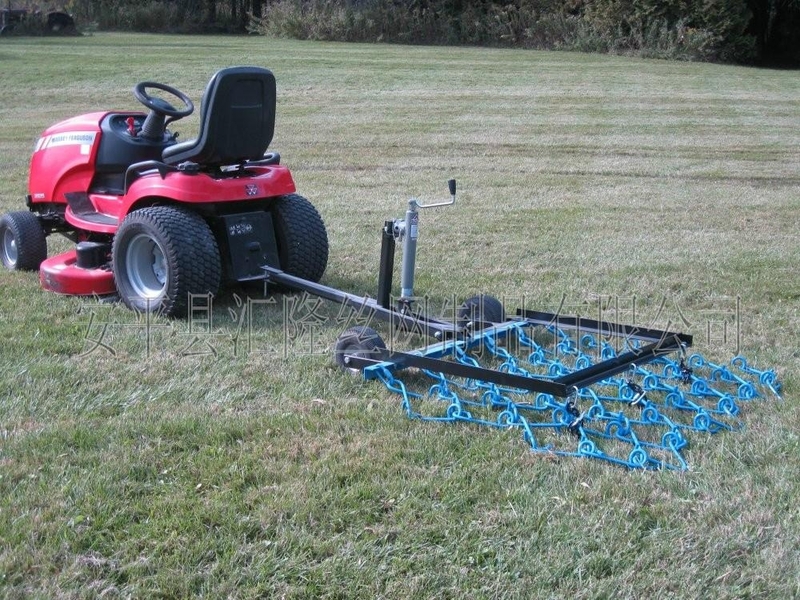 Improve the quality of your yard or make your wildlife food plots more productive with the ATV Harrow Drag. Use it to work seed, fertilizer or organic material directly into the soil while eliminating parasites, removing dead matter and allowing better penetration by water, air and nitrogen. This threeway tool performs various types of farming operations: Harrowing, dragging, smoothing, floating and scarifying. Set it for light or heavy penetration or turn it over and use as a drag mat. It works on any terrain contour. Harrow teeth are rugged high-carbon steel and the draw bar is extra-heavy-duty tubular steel to ensure long life, even with hard use. In combination with field cultivators, the tine harrow prepares a firm, level seedbed or follows to pack and cover. Used alone, it breaks up crust, ridges or stalks for minimum or no-till operations. The various sizes of the tine harrow make it ideal for mounting behind your disc, field cultivator or applicator for one-pass applications. Low, wet areas dry more quickly when aerated by the a tine harrow. Arenas or playing fields become smooth and loosely packed, a safe surface for activities. Set the tynes to fill holes and level or to loosen soil and aid drying. Gravel roads or dirt paths are quickly maintained, dried and raked. Unmanaged turf becomes heavily thatched, preventing healthy new growth from reaching its full potential. Harrows stimulate growth by surfacing the dead material, helping to aerate the soil; and strengthening the grasses. Export Markets︰ Drag Harrows are widely used at surf-preparation, soil leveling, soil loosing, etc.